mendis roogas vedeut zaneh ha - moodas zenim neh preneth kath". But I could not make an Idiot understand the truth.."Lalded. These words of the great Kashmiri poetess speak out my mind . Whatever I write or have written, Is not for the ignorant who are out to submerge not only the Kashmiri nation but the entire subcontinent under the flood of hatred, and for their petty interests only . In doing so, they tend to become the brokers of death and destruction for human beings. I do not write for those who have been dehumanized by vested political interests; who have been made buffoons for their pecuniary benefits. Their conscience does not even permit them to think that the evil of hatred and religious bigotry foisted upon them by political motivators assume the shape of terrorism and turn into a bomb. When these bombs are hurled on roads, in mosques bazaars and houses, human beings are torn into shreds and their limbs are flung right and left. A few days ago, someone got to the net and proposed Kashmir's accession to Pakistan on the basis of religion. He suggested " that since non-Muslims of Ladakh and Jammu will have to be included into the independent Kashmir, therefore, Kashmir minus Ladakh and Jammu, which means the valley of Kashmir, should go to Pakistan" Such ridiculous arguments befit only those about whom the holy Quran says, " We have bereft them of their power of hearing, seeing and understanding "
I have been saying for last ten years that whosoever has ever spoken of partition of Kashmir, in one form or the other has been actually carrying on the plan of the Pakistani rulers and its ISI . The very basis of " Operation Topac " was the concept of taking the valley of Kashmir to Pakistan. It has now been proved that the Pandits of Kashmir were extirpated from Kashmir Valley with the same objective in mind. A member of a responsible organization called Kashmir American Council, has pleaded in favour of the concept on the net. Whatever camouflage Kashmir American Council and World Freedom Movement may assume, the cat will be out of the bag sooner or later. The truth cannot be hidden for all times. Those who talk of taking the valley to Pakistan on the basis of religion, are perhaps the greatest enemies of the Musulmans. If the Muslim majority regions of Kashmir are incorporated in Pakistan through proxy war and terrorism or by sending Afghans and other people into the valley, the subcontinent will once again become the hell as it had become in 1947 in the aftermath of partition. If this happens then the Muslim of Ladakh, Kargil and in Jammu region will be endangered seriously and they will be forced to migrate from their places. They will be pushed into the valley of Kashmir. We shudder at the thought of the treatment which the Hindu religious fanatics will mete out to the 18 crores of Indian Muslims in such an eventuality. They will face untold hardships and humiliation. When we decide to divide people on the basis of religion, then the religious extremists of other faiths cast aside their thin veneer. In such a proposition, you do not actually ask for the valley; you only ask for the water resources which lie in the valley. And you want a strategic depth which means securing Pakistan's borders. Thus you are using religion as a weapon to realise your political objectives. I am surprised to know that those who call Pakistan a country of 99 per cent Muslims do not look inwardly when they want Kashmir to join Pakistan. Are they not the same Muslim who declare one another as heretics on the basis of groups and sects? Are they not the same Muslims who undertake gunning down of people while they are praying in mosques? Are not they the same Muslims who massacre their own people in Karachi, who make holes in the bodies of their victims with boring machines? 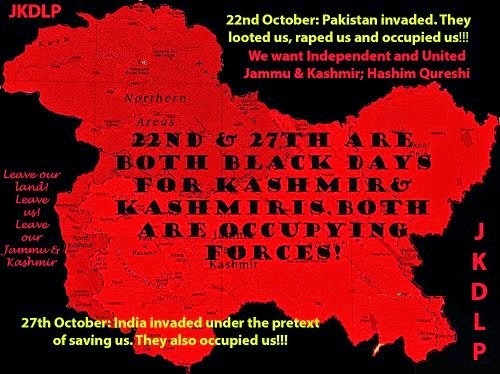 Do they want to make Kashmiris as partners in these crimes by demanding Kashmir's accession to Pakistan? Was not East Pakistan inhabited by the Muslims who were butchered in lanes, streets, houses, schools and universities, and as per the reports of international organizations, 2.5 lakh of their women were raped?. We Kashmiris are tasting the same Islam today. Our centuries old culture of mutual love, respect and brotherhood has been rent asunder. Our Pandit brothers and sisters have been terrorized and extirpated from their hearths and homes to live in exile in abject misery. Those of the Pandits who remained in Kashmir, they and their infants and women have been butchered like animals by these so-called Mujahids. How unfortunate that they call these acts of brutality as Islamic. Victor Povel from Germany is right in saying : "that entire West has been terrorized by the same people and is living in a state of constant fear". Thus the religion of Islam, which teaches love, patience, understanding and coexistence among all faiths has been put to disrepute by the actions of the same pseudo Muslims. Pakistani rulers and those who support them for partition of Kashmir should remember one thing. Owing to the fear of independent Kashmir, Pakistan is pursuing the agenda of permanent partition of Kashmir. India and her stooges are also supporting her for this agenda when they say that LOC be converted into international border. In a situation of Independent Kashmir, both the countries will have to take their hands off Kashmir. This is the reason why the two countries are pressurising each other in keeping the Kashmir issue alive and occasionally talk of partition of Kashmir. But it should be remembered that partition of Kashmir will take place only when the Kashmiris are finished. Kashmir has a bright and shining future but only when she is independent. The way in which people of varying opinions inside Kashmir are being killed by the forces on both sides, will not help them achieve their objectives. Only more blood will be spilled. To discard all religions except Islam is in fact to betray ignorance of Islam. The Quran is very clear in saying " lekum dinakum waliyum din" (every body to his faith). What is more, the pseudo-Islamists and tormentors brandish the name or Islam before us, the suppressed people, but they beg economic aims from the Christians and the Jewish economical forums. They ask for loans from Jewish organizations. One could also cast a glance on Islamic countries which sometimes join the Americans to launch an attack on Iraq. ln Afghanistan, Musalman is killing Musalman .If you intend introducing Kashmiris to this Islam, then let us say with all humility that this kind of Islam is not acceptable to us. For us the Islam brought by the Holy Prophet of Arabia (PBUH) and his lieutenants is good enough. The Prophet's Islam teaches mutual love, tolerance, good character and mutual respect. In conclusion, I want to speak a word to those who have engaged themselves in politics in Kashmir and are fighting for Pakistan's cause. Stop calling those people who differ with you in their view points as Indian agents notwithstanding to whichever group they belong -- political activists or armed groups, Stop killing them (Dr. Ghulam Qadir Wani)otherwise it is just possible you force their supporters to pay you back in the same coin. Is it not a fact that those who have had ideological differences with the Hurriyat and dissident leadership were branded as Indian agents? When it Suited them, these ideological opponents were liquidated and then their detractors joined their funeral processions to express their condolence. Maulana Masudi fell to the bullets of the Hizbul Mujahideen activists. Then the leadership of the same group attended on his grave for FATHE. Is it not hypocrisy? No fewer than 14 charges were brought against Hilal Beig. But when the security forces killed him brutally the entire Hurriyat joined his funeral procession, Is it Islam or hypocrisy? 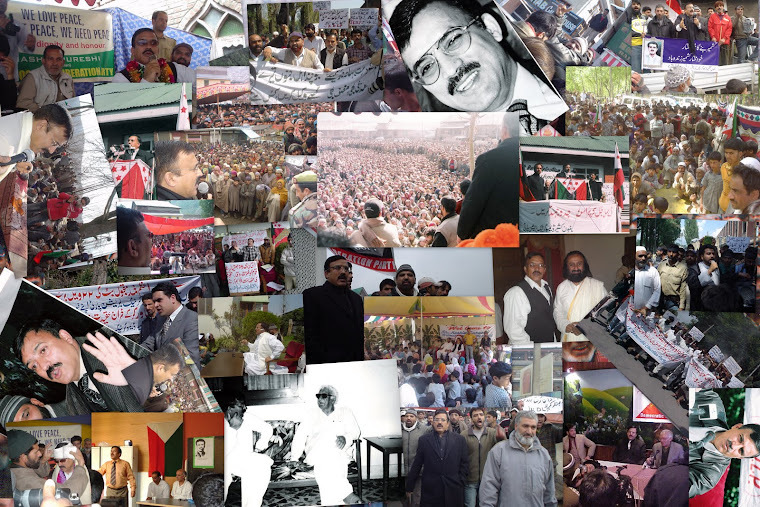 A situation was created in which Dr. Ghulam Qadir Wani was projected as an enemy. He was dubbed as Indian agent. But when he was killed, the same detractors joined his funeral procession. Azam Inquilabi devoted his entire life to the service of the nation. When he was spending most or his days in the jails, some of the present - day Hurriyat leaders had become ministers. While he is fighting the battle for freedom, he is also being dubbed as Indian agent.. He should also know that now may be his turn and his detractors will join his funeral as in the case of others. Shabbir Shah may also be targeted. Those who are behaving like ostrich and think they are safe at all. All these leaders and their followers shall have to stand up against this wanton destruction and killing. 3, UNITE ALL THE NATIONALITIES FROM LADAKH TO JAMMU AND FROM GILGIT TO BHIMBER. 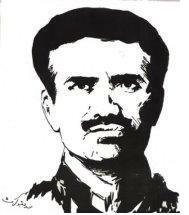 4, REJECT ANY CONSPIRACY OR PLAN OF DIVIDING KASHMIR. 5, CARRY ALL THE PEOPLE LIVING IN JAMMU & KASHMIR WITH YOU FOR A UNITED STATE OF KASHMIR. 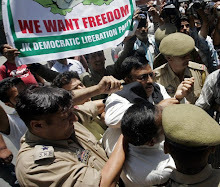 6, LAUNCH A NON - VIOLENT INTIFADA WHICH WOULD AIM AT PUTTING AND END TO INIMICAL RELATIONS BETWEEN INDIA AND PAKISTAN NOT THROUGH HATRED BUT ON THE BASIS OF HAPPINESS AND DEVELOPMENT OF THE PEOPLE OF KASHMIR. The subcontinent has seen enough of destruction of life in the name of religion. We need to unite, one and all. We need to renounce EGOISM. We need to be prepared to die for the TRUTH, and we need to liberate ourselves from the fear of death. Lastly I want to inform all the concerned people, on the basis of a very dependable source that ISI and its cronies have begun their nefarious designs of targeting Shabbir Shah and Azam Inquilabi by calling them " India's people". Apart from them, I am also being served warning through various sources to keep in sight the fate of Ghulam Qadir Wani and that my family cannot remain safe in the valley. BUT WHO WILL MAKE THEM UNDERSTAND THAT LIFE AND DEATH OF A PERSON IS IN THE HANDS OF ALLAH.